A year ago today, we walked through the Old City. Our day began by entering the Temple Mount area and viewing the city from there. You can imagine the temple as it once stood on this location before it was destroyed by the Romans in 70AD. The beautiful Dome of the Rock now stands out on this platform. Our tour continued at the Pools of Bethesda and then we walked west on the Via Dolorosa toward the Church of the Holy Sepulture. After eating lunch and doing some shopping in the Christian Quarter, we walked through the Spice Market and arrived at the Jewish Quarter where we visited the Western Wall. We toured the ancient city of David and then walked through Hezekiah's tunnel. Our day ended on the steps leading up to the southern end of the Temple Mount. Jesus and His family used these same steps about 2,000 years ago. Tomorrow: We visit the Shephelah. This view of the iconic Jerusalem skyline is a staple to many a postcard vendor. However, panning out a bit outside the Ottoman-era walls reveals two important locations. 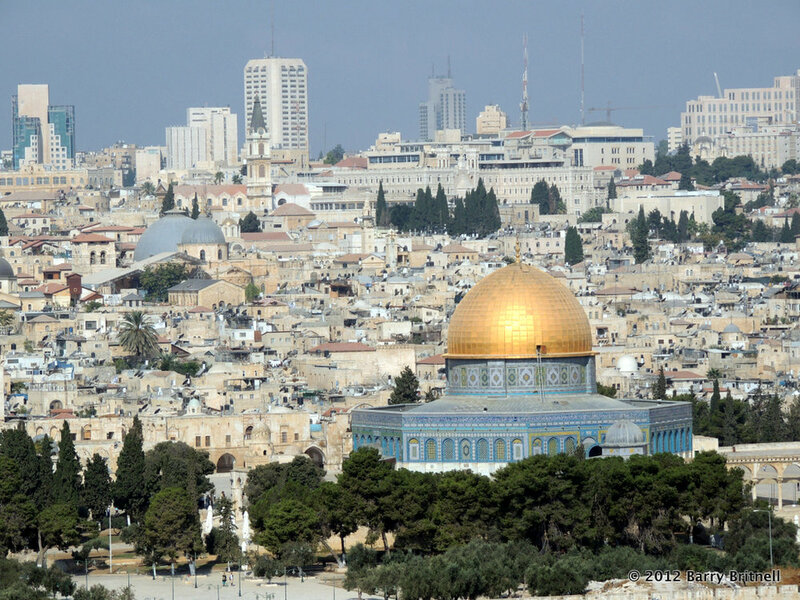 First is the Temple Mount which today features the Al-Aqsa mosque and the Dome of the Rock. And, across the street from the Temple Mount and slightly beneath the brilliant blue rooftop is the Iron Age City of David—the original Jerusalem. This small mound was protected on all sides from approach, except from the north, where an enemy could approach unseen down the ridgeline. Thus, the Temple Mount not only served as a holy place, but also as fortified protection from hostile forces from the north. [soundcloud url="https://api.soundcloud.com/tracks/189042930" params="auto_play=false&hide_related=false&show_comments=true&show_user=true&show_reposts=false&visual=true" width="100%" height="450" iframe="true" /] In Psalm 125, the psalmist draws a beautiful comparison between the mountains of Jerusalem and the love and protection that God provides to His people. But, in order to fully appreciate what the psalmist means, you have to have an complete understanding of the geography of Jerusalem. That is what we will be discussing on this program. For the past several summers, Dr. Eilat Mazar has been leading many of the excavations around the City of David just south of the Temple Mount in Jerusalem. Recently, she has been concentrating her efforts in the area of the Ophel. A couple of days ago, their group released a fantastic video showing some of the most recent excavations. These digs have centered around a cistern from the Second Temple period as well as some underground caverns and tunnels. The current assumptions is that the cistern collected rain water for public use during the time of King Herod. The Jewish historian, Josephus, mentions that many of the Jews hid in underground caverns and tunnels during the time of the Roman overthrow of Jerusalem around 70AD. It is possible that some of these tunnels that are mentioned in the video are the same ones mentioned by Josephus. Honestly, it may be hard to know exactly. But, it is interesting to think about. I wonder what they will dig up next?